One of the greatest fears facing parents of children with autism is the risk of drowning due to lack of danger awareness. Almost immediately after relocating The Vista School to the Springboard campus in 2011, Vista’s Board of Directors embarked on construction of a swimming pool to address this critical safety issue. The Board also committed to a five-year, $650,000 fundraising campaign to offset the costs of tenant improvements. The pool alone amounted to almost 40% of the total cost of the tenant build-out. Thanks to the generosity of many donors, we ended our campaign on schedule and exceeded our fundraising goal! Not only are we able to teach critical water safety and awareness skills, but we also can help our students, who sometimes become quite sedentary as adolescents, to improve their overall health and fitness. “It is a fun social event that allows for interactions with their peers and pairing time with staff,” said Mark Jackson, Vista behavior technician supervisor. Most Vista School students experience the world around them differently than does a typical child. They may be over-sensitive or under-sensitive to smells, touch, taste, sights, and sounds. 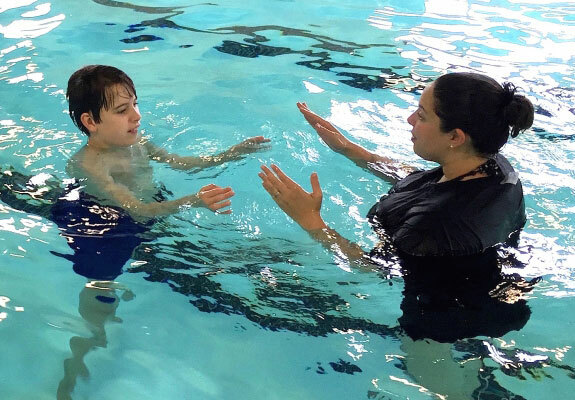 “The hydrostatic pressure that the pool water provides alone can help each student in a variety of ways,” explains Doreen Hand, physical therapist. “I love that we have this opportunity provided to us on our campus,” Hand said.